Next year I’ll try planting even earlier. It’s not a huge harvest, but it’s fun to do, especially with kids. A richer media (like a green compost along with soil) might give you a better harvest. 1) Use a plastic trash bin with holes drilled into the sides. Be sure to locate the barrel in full sun. 3) Cover with soil and water well. 4) As shoots and leaves emerge, continue to add soil or other media to the barrel, leaving the tops of the shoots and a few leaves exposed. 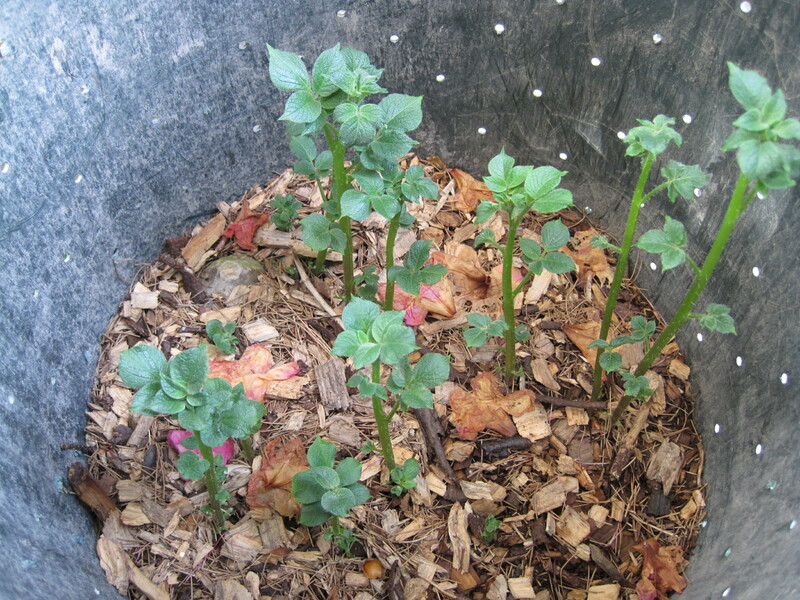 I used a mixture of soil and composted wood chips. Water well. 5) Continue to add media as needed, and continue to water through the season. 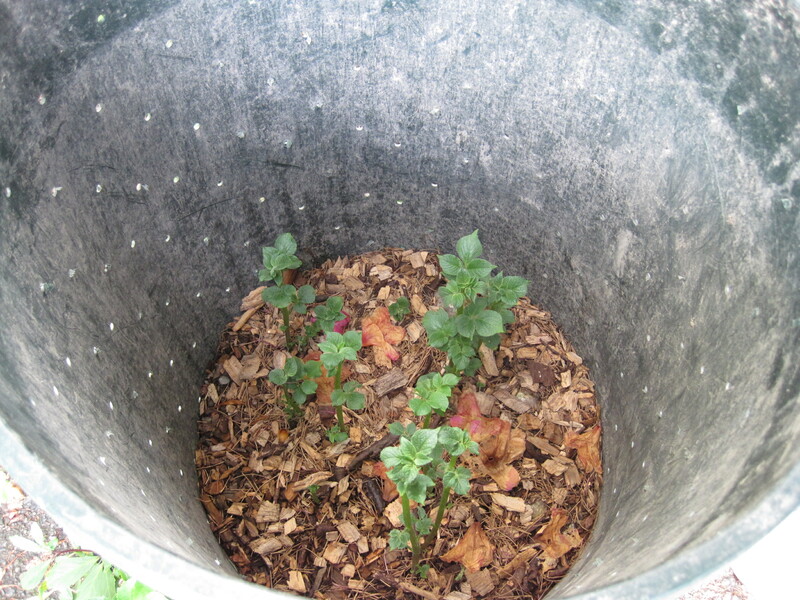 6) When leaves begin to die back, you can dump the barrel onto a tarp and pick out your potatoes. Save the media for next year’s barrel. I resorted to do this a few years ago when the potato scab became a serious problem in my raised beds. Using fresh soil in containers each year keeps my spuds scab free – I have tried all sorts of remedies in the raised beds including careful crop rotation, sulphur supplementation (Tiger 90) to change pH, etc. Scab returns every time I try to grow in my raised beds even after 3-4 years of not using them. And frankly for this old body, using containers is much easier on the body than digging! One of the reasons I use wood chips is that the microbial population there tends to be at least neutral if not beneficial. Their presence helps moderate the growth of pathogens. My problem is ants. I’ve tried in the ground, raised beds and barrels. I thought for sure a barrel would be the solution. Nope! They got into the barrel and when I dumped them out to harvest them, all that was left was a few skins. 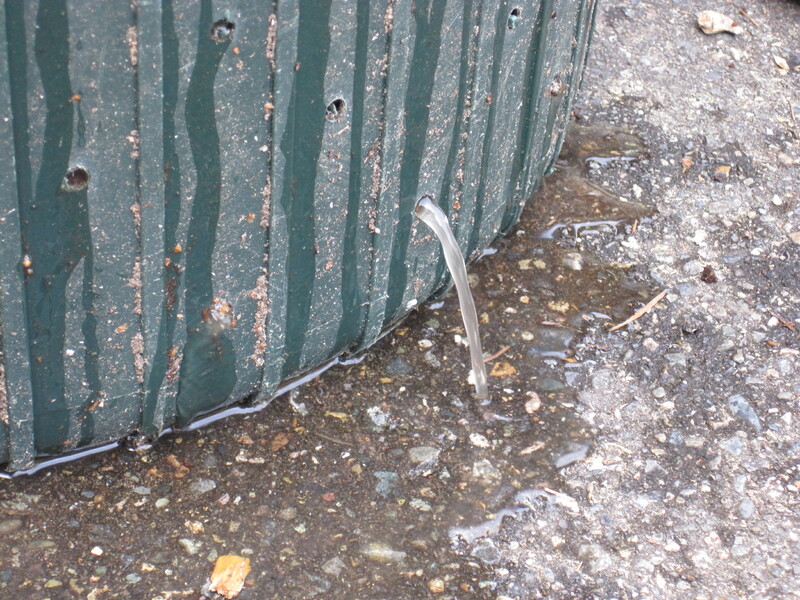 Before you place the barrel, sprinkle a generous layer of diatomaceous earth on the ground. I tried that this past year and no ants–or slugs. Am I correct in my understanding that this method works really well with mid-late potato varieties, and not so well with early varieties? 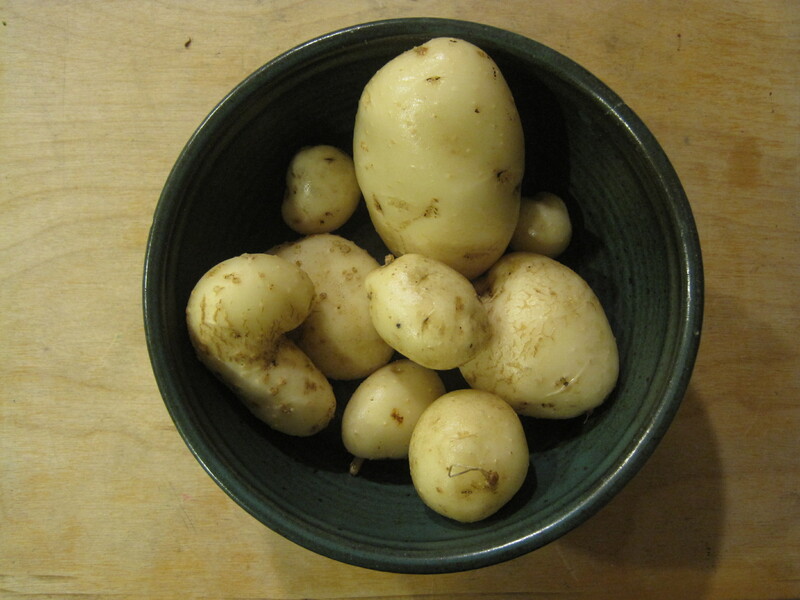 I read in a newspaper article some years ago that the early varieties set a certain number of taters, and that’s it. The late varieties will continue to set new taters each time the stem is buried. Is this true? 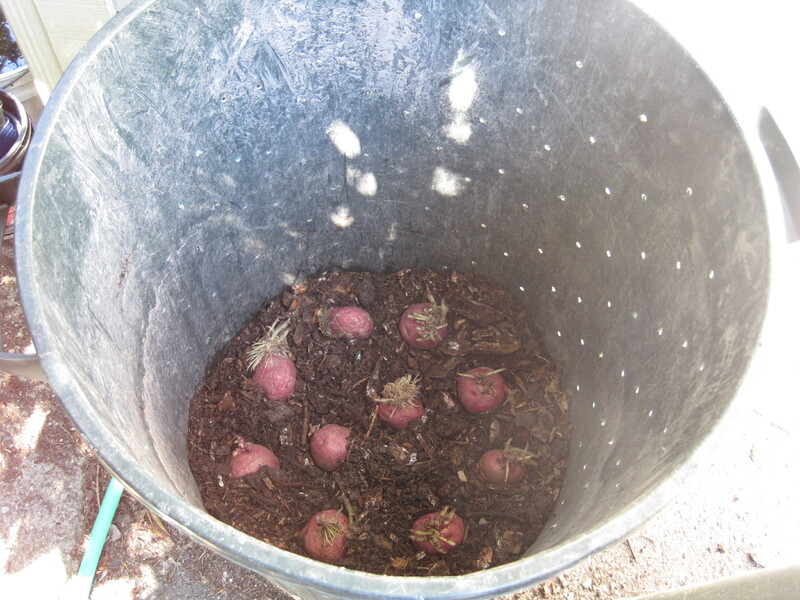 I tried the barrel method for three years and always had undersized potatoes, using different media. I just dedicate space in the raised beds now because we like homegrown potatoes so much. I raised potatoes in a larger size cattle water trough with soil on the bottom and straw on top. I planted about 12 potatoe starts with eyes and in about 3 months we were digging up, (actually uncovering) 50 or so good size yukon gold spuds. What we didn’t make into home made hash browns and freeze we had to give to our neighbors. my problem was termites, not ants. I’ve switched to containers with saucers under them plus raise them off the ground using pallets and this has improved the quality of the potatoes. ALSO need to pollinate the flowers to get the actual potatoes. if poorly pollinated the results are pretty much nil. Previous Previous post: What’s wrong with my pine tree…? Nothing!